Grab your magnifying glasses and reading glasses, it's time to become a dictionary detective! Or a lexicon lawman. Or a syllable sleuth. Perhaps an alliterative agent? Wordspector, from Moido, is a fast-paced word game that will have you scrambling to find the secret word using deduction and a bit of luck. In each round, you are given a pool of 16 letters and a word to find using said letters. Letters may appear more than once in a hidden word. 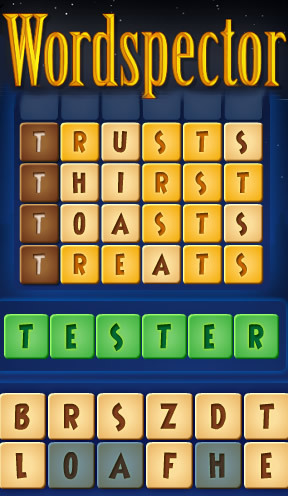 To solve each puzzle, type or click the letters to make a word (working around the brown given letters, where provided). Letters that are correct and in the right position in the word are marked in green, and letters that appear in the hidden word but in the wrong position are marked with yellow. Letters that aren't in the target word remain gray and are shaded in your letter pool. Using your powers of deduction and your massive dictionary brain, find each word before time runs out to move on to the next round. Each level has three words, and beating two levels unlocks a bonus round where you can rack up points by finding as many words as you can that start with a given letter (or, you might get a "sunob" round where you have to input all of your answers backwards, but for double the points). The letters given to you at the beginning of each puzzle will jump from position to position and eventually disappear completely before the words grow in length to five, six, or more letters. Analysis: If the format of Wordspector seems a bit familiar to you, it's comparable to a word version of Mastermind, or perhaps a bit closer to the game show Lingo. The major difference is that instead of a limited number of guesses, you're racing aganist a clock. Thus, it might be to your advantage to make many guesses to narrow down the possible letters if you're stuck, however this also diminishes a bonus available for guessing correctly in fewer words. With most word games, there seems to be one issue or another with the dictionaries used to compile the word lists. Normally the complaints seem to be that the word lists are too small, but in this case, it almost seems as if the word list might be a bit too large. We've not yet submitted any words that the game didn't find valid, but the game has selected some obscure words for us to guess (this is where the deduction element really comes into play). That much said and done, there's nothing wrong with challenging your brain a bit, is there? Whether it's feature or flaw, Wordspector takes a familiar challenge and puts a new twist on it that will have you fingerprinting the dictionary for clues. Great game! That's me in 15th spot, just under a million. The only thing I would change is when entering letters with the keyboard, I would let the given letter be typed. I spent a lot of time typing the whole word, backspacing the whole word and then retyping. The sunob levels were fun and they occurred just often enough not to be frustrating. Apparently, the dictionary has now been cut down to 5000 words, with all the obscure words removed. Hmm. I already gave the game 5 stars, but I've since decided the dictionary still needs some work. I just typed in (sorry) darky, which was accepted, and the answer ended up being fatty. The first isn't a word in my book, and the second is technically a word, but a poor one. Oh well, this is always a problem with word games. They always seem to have dictionary issues. Beyond that, though, this game is just about perfect. Game play, keyboard control, and everything else is implemented very well. This is a new addiction for me. Also, a warning: If you block Flash "cookies", like I do, you cannot continue if you lose a level! Always create two lists: One for accepting words (very large) and one for puzzles (fairly small). 1. Artichoke leaves and shoots, blanched to eat. Hello, developer here. Thanks for the feedback! Glad to hear people enjoy our game. We are currently putting finishing touches on an iPhone version of Wordspector so all suggestions are very welcome. You can also contact me directly at tero(at)moidogames.com. Fun game. The music reminds me of the 'Pink Panther' theme. I really enjoyed that game. I agree with Barbara though, that I lost a lot of time clicking/typing the letter that was already given because it's much faster to type/click a word how you spell it, without missing a letter. It actually got a bit frustrating in the end. I'm glad to hear about two lists. I also agree with those that mention having to skip over the given letter. That does make it hard to type. I also would suggest an option (maybe easy/normal mode) to be able to type in any word, even if it doesn't use the given letter. This would help significantly if you are given an odd setup (like _g___) with very few words to guess letters. I think this is what ends a level for me more often than anything else! With the easy mode, it seems like you could just use the hint style you already have in place. Also, once a letter is determined to be in the correct place, it would be nice if that letter showed up using the hint styling in the typing block. I was about to complain about having to not type the given letter as well, but after thinking about it, I'm not sure the alternative would be any better. Suppose you were given _ E _ _, and you started typing FE... how is the game supposed to determine if you are trying to continue onto FEED or FELT? It has to be one way or the other, and I bet if it had been designed the opposite way, people would be complaining about being forced to type letters that are already there. One solution I see is a combination of two of OverZealous's suggestions: make the initial letters basically a free hint, displayed as an overlay on the tiles, but allow the players to guess any word they want. Thanks a lot for the constructive criticism! It's a rare thing to find online. @zxo: You hit the nail in the head. Both typing methods have their drawbacks. The game was actually designed mainly for mouse input, with the keyboard being a "power user" option. With mouse input the other method would be very counterintuitive. But we'll look into it and maybe add an option to choose either one in future updates. I enjoyed this game, and had no real complaints about the gameplay (only my own brainpower! ), but I was a bit disappointed by the achievements. Getting 10 in a row within 3 guesses is fine, albeit tricky. But if you are able to complete the game, then getting to level 2 100 times will be really easy but really boring - not really what we want in an achievement! And even more aggravatingly, while getting through the game without hints is a nice challenge, I found that my run of rounds without hints was broken. Now, I'm not sure whether it was because at one point I closed the game and came back to it later, or because I started failing and having to restart the level. If the former, I cannot see the logic of having to do the game in one sitting for this achievement when there is a perfectly good save feature. If the latter, then this is amazingly difficult: Has anyone on this site managed to complete it with no hints and no level restarts? So yeah, great game, but I'm not keen on the achievements system. About typing the given letter or not, I was thinking that it should _only_ assume the given letter was being typed. I was also thinking that for selecting letters by clicking, the given letter should be skipped as it behaves now. Just a guess, but I would think that those who choose to enter the letters using the keyboard would be people who can type fast, and who tend to type whole words as a single action. @barbara: Yes, I thought of the same thing after I'd already posted the reply. It might not be trivial to separate typers and mousers, but we'll see what we can do. For the highest no-hints achievement you really do have to survive through the entire game without hints or restarts... Admittedly it's crazy hard, but that's how top level achievements should be. :) I've gotten to the seven letter words without hints myself, and my best score's not even in the top10 anymore. I'm pretty sure the #1 player made it all the way without hints. I definitely see the point of the work experience achievement, but there's very little incentive to start a new game once you've got going. Most people will keep pushing until they win it (or give up), and no-one's going to go all the way through it 100 times! Whereas if, say, the achievement was for number of words correctly guessed, then it would be available to someone who gets stuck a few rounds in, but also for someone who whizzes through it a few times. As for the no-hints achievement, that's strange because I went through it a second time without exiting and re-entering and I got the achievement - despite having to restart levels a load of times. Awsome Game. I only started having trouble, though when you used 5 letters. This game is addicting! Had a problem with 6 letter words. Gave me an option ending in _ _ _ _ _ O. How many 6 letter words end in O? Especially when the letters given didn't have many common letters like N (so no poncho, rancho, etc.) With hindsight it was probably PSYCHO, but at the time I wasn't able to make any guesses to help me. Asking for a HINT gave me _ _ _ _ H O. So it ended up just being a race to guess the word outright with no help from entering real words. The solution might be to ensure that at least X numbers of words from the full dictionary can be entered using the given letters and the first/last/middle letter constraint. Hi again. Just wanted to let you know we've updated Wordspector. The update improves the hint feature and changes the criteria for experience achievements (thanks Pejar for a great idea!). Also some questionable words (like 'chard' mentioned here) have been deleted from Mystery Word list. @clickety6: Sorry you felt the game was being unfair. I'd argue the luck element is part of Wordspector's unique charm... ;) But yeah, sometimes you don't get much help from other words. You can use the hint 2-3 times per word though, and it also helps that the mystery words are common words. very nicely made, though, & probably a fine bit of entertainment for people not wordskilled enough for word machine.